There will be a Mass of Christian Burial officiated by Rev. John Jerek at Saints Cyril & Methodius Church on Thursday, September 6 at 10AM for Theresa M. Olenik, 90, who passed away peacefully on August 30, 2018 at home. 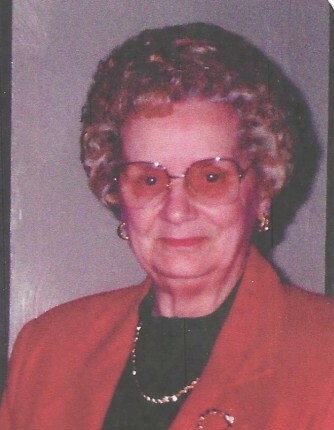 Theresa was born on December 6, 1927 to William (Valent) and Helen (Skovira) Sefcik in Oak Park, Smokey Hollow, Youngstown. Theresa was a lifelong member of SS Cyril and Methodius Church where she attended grade school. She graduated from Rayen High School. She was married to Michael J. Olenik 30 years before his passing in 1978. Theresa was preceded in death by her parents, sister Helen Sefcik Wagner, brother William Sefcik, son Ronald Olenik, and grandson Michael Olenik Jr.
Theresa is survived by her daughter, Nancy Olenik of Pittsburgh, son, Michael (Deb) Olenik of Youngstown, son, Steven Olenik, with whom she made her home, and her sister, Anne Switney. She is also survived by her grandchildren, George Hromyak and Jennifer Hromyak Dayton, Janelle Hromyak, Dawn (Dan) Milliken, Rena Olenik and great-grandchildren, Katilyn and Madilyn Testa, Caleb and Michael Hanna and Parker and Zoe Dayton. Family and Friends may call from 5 to 7 on Wednesday, September 5th and again from 8:30 to 9:30 AM on Thursday, September 6th at The Fox Funeral Home, 4700 Market Street, in Boardman. In lieu of flowers, Theresa’s family asks that, in order to honor the kindness of Theresa, each of you do one kind deed for someone else. Family and friends may visit www.foxfuneralhome.org to view this obituaryand send condolences.